New children's book addresses the question: Does it really take a village? Feeling someone special is missing from his life, a young child discovers the amazing men who empower and encourage his growth in a new illustrated book released by Dog Ear Publishing. Dog Ear Publishing releases “Just as Special” by 3Evoke, LLC. Illustrations by Colette Robbins not only capture the hearts and minds of the readers, they play a vital role in showing the interactions Mason has with the men who have been important role models in his life. 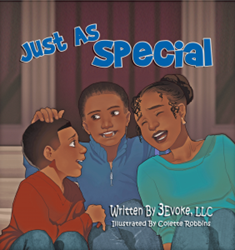 (PRWEB) June 23, 2015 -- Dog Ear Publishing releases "Just As Special," the first in a series of illustrated children's books by 3Evoke LLC. The book is designed to encourage children to express their thoughts on living in a father absent home and engages parents to have a conversation with their child, to help them discover the men who add value, love and security to their lives. Watching his friend Nathaniel play outside with his father, Mason wonders why his dad is not around to spend time with him. Through a heartwarming conversation with his mom and brother, Mason discovers the amazing people in his life who make him feel safe, laugh, share adventures with him and teach him the value of hard work. Illustrations by Colette Robbins not only capture the hearts and minds of the readers, they play a vital role in showing the interactions Mason has with the men who have been important role models in his life. They also serve as a tool by which children can see Mason express his emotions as he navigates from a state of sadness to happiness while discovering he has value and support. With 24 million children living in father absent homes, the women of 3Evoke, LLC want "Just As Special" (along with future offerings in their children's book series) to help parents and children successfully navigate discussions related to difficult life topics – showing parents and children that you can find positive energy and inspiration from trying situations. “This is one of the best books I have read.” Dalawntae, 13 years old. “This is not just a book. This is a movement,” Brenda Powell said. The women of 3Evoke LLC – Marquetta Irons, Vonda Mattox, Loren Williams and Yolande Wooten – want to encourage the personal growth of youths through learning, achievement and self-expression. Through inspiring storytelling, their mission is to empower our children with positive images, thoughts and values. When they are not creating new material in their home base of Georgia, the ladies spend their time being active participants in their community. Dog Ear Publishing offers completely customized self-publishing services for independent authors. We provide cost-effective, fast, and highly profitable services to publish and distribute independently published books. Our book publishing and distribution services reach worldwide. Dog Ear authors retain all rights and complete creative control throughout the entire self-publishing process. Dog Ear Publishing reviews services and other book marketing services are available to connect great content with interested readers. Self-publishing services are available globally at dogearpublishing.net and from our offices in Indianapolis.